Their own motivation, work ethic and commitment. Your guitar teaching skills and your ambition to help your students reach their goals. You can’t control your guitar students’ level of commitment, but you can control your guitar teaching skills. 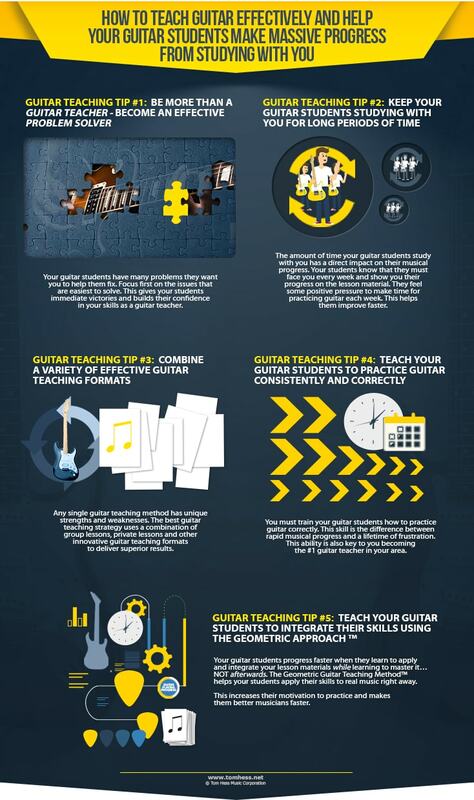 Answer: Teaching guitar the right way is easier than you think. The problems your guitar students face are caused by many similar things. 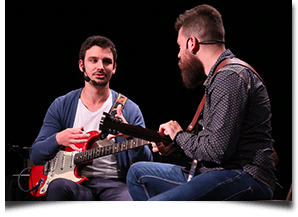 The best guitar teachers know how to identify these causes, how to spot them in their students' playing and create effective solutions that make their students improve very rapidly. You can learn to do the same. When you do, you become the #1 guitar teacher in your area. Your guitar students have many problems they want you to help them fix. Most guitar teachers try to solve the biggest cause of their students’ problems right away. This approach does more harm than good to many of your students. Dealing with the biggest causes of your students’ problems first can make them feel bad about their playing and doubt their potential. This mindset causes some people to quit guitar lessons. What to do instead: Learn to manage your guitar students’ emotions as you improve their musical skills. Focus first on the issues that are easiest to solve. This gives your students immediate victories and builds their confidence in your skills as a guitar teacher. This confidence inspires your students to overcome their next (bigger) challenges (with your help). Such method for solving your guitar students’ problems is one of the keys to your long term success as a guitar teacher. The amount of time your guitar students study with you has a direct impact on their musical progress. Being an active student makes them feel accountable to learn and practice guitar on a consistent basis. Fun fact: The more money your guitar students pay you, the better they tend to become as musicians. Example: I charge $250 an hour for live, in-person guitar lessons. Guitar students who invest this much money to study with me are totally committed to do everything I tell them to do. These students make a lot of progress in a short amount of time. Part of that progress comes from my proven guitar teaching methods and skills. The rest is a direct result of the students’ own commitment and desire to maximize their investment. Learn how to keep your guitar students taking lessons for a long time and make them love every minute of it. are unable to make a good living. Private guitar lessons and group guitar classes are the most common guitar teaching formats. Most guitar teachers falsely believe that private guitar lessons are the best way to teach guitar. This is false. Private guitar lessons can be valuable for some situations, but this teaching format also has many weaknesses. Group lessons are far superior to private guitar lessons in most cases (if they are taught correctly). Answer: This problem is easily solved when you know how to teach group classes the right way. Guitar teacher training helps you improve your guitar teaching skills and become the best teacher in your area. The video at the top of this page is a sample of a group guitar lesson (taught in front of more than 150 guitar teachers). Teaching group guitar lessons also makes your guitar teaching business incredibly lucrative. This guitar teaching video shows how. You must train your guitar students how to practice guitar the right way. This skill is the difference between rapid musical progress and a lifetime of frustration. Trust them completely and do what you tell them to do. Be strong-minded enough and not get distracted. Persevere if they do not see immediate results. …most of the time this doesn't happen unless you do your job of “selling” the benefits of correct practice in advance. Training your students to practice guitar correctly is key to becoming the #1 guitar teacher in your area. Most guitar teachers take a linear approach to teaching guitar. They teach their guitar students in a step-by-step, sequential way. Example: many guitar teachers teach their students various skills and pieces of musical knowledge…but not how to integrate their skills together. The result: many guitar players struggle to apply their skills to playing real music. It’s frustrating to be advanced in one area (such as technique) yet feel like a total beginner in another area (for example - songwriting). Solution: teach your guitar students using the Geometric Guitar Teaching Method™. This means you should not wait until a certain skill is mastered before teaching your students to apply and integrate it with other skills. Implement these tips to help your guitar students become better guitar players and grow your reputation as a highly effective guitar teacher in your area. This guitar teaching eGuide helps you keep your guitar students from quitting lessons.